Fur Shui continued to enjoy many places in and around Sanibel Island, Florida! Sun, beach, shelling, dolphins, and very wonderful people to visit with. 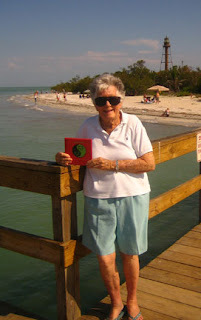 My hosts Jean B and her mom Jean A took Fur Shui visiting all over! The fishing dock at the lighthouse was a big favorite, checking to see if any large Sheephead fish were being caught, and lots of sea birds just waiting for the catch to come in! 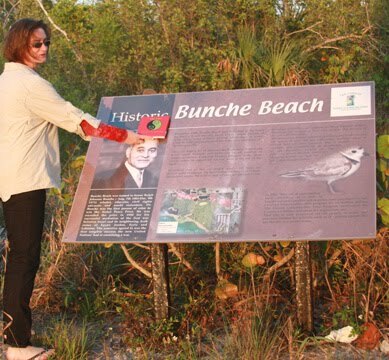 AND, a wonderful beach in Ft. Meyers, Bunche Beach which got its beginnings by Mr. Bunche before integration and equal rights became the focus. Started as a beach honoring blacks and now all enjoy its lovely long tides and wild life sanctuary. 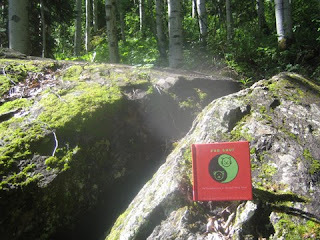 Actually the color black is all about life purpose and path in Feng Shui. 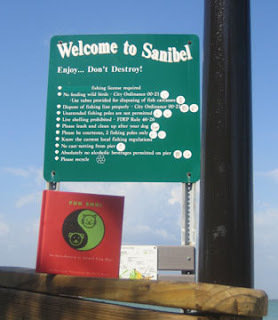 This is certainly the case for all the wildlife now finding protection, sanctuary and purpose for our lives here at Bunche Beach. Many thanks to the two lovely Jeans in my life! 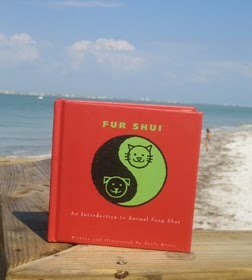 Fur Shui recently relaxed in and around Sanibel Island, Florida with Jean and mom Jean! Visiting wonderful reserves like Ding Darling National Wildlife Refuge, as well as Bunche Beach just on the other side of the causeway in Ft. Meyers. 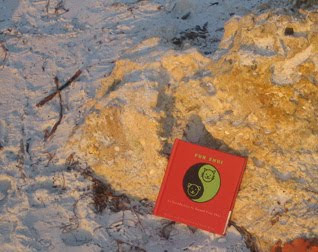 The red and orange sunsets matched the book's cover and also introduced its reputation to show up in famous (red is the color of Fame!) places where wildlife is protected, and people can relax, connect up with nature as well as their own very special internal "nature". Thanks Jean and Jean's mom Jean who is having fun at the end of the dock down at Lighthouse Beach! 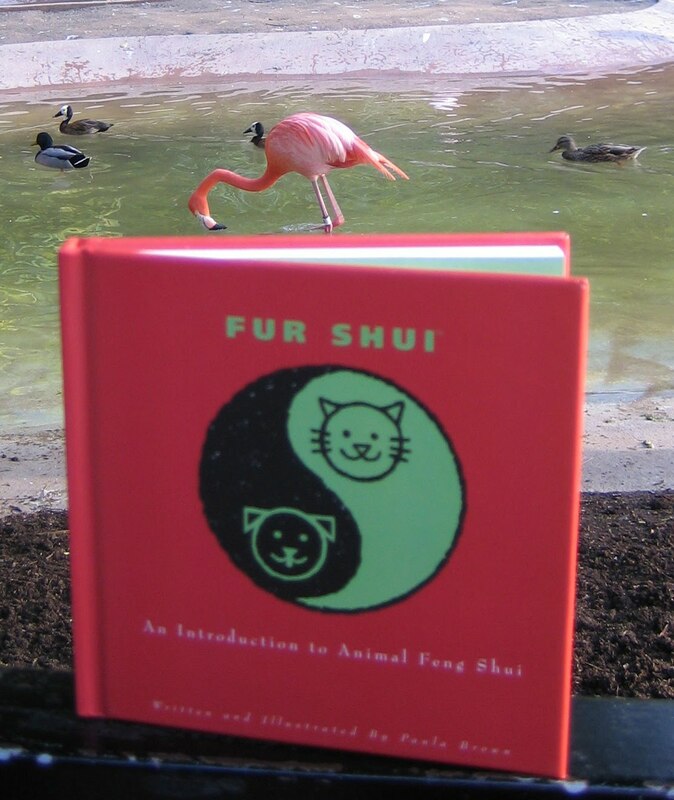 The San Diego Zoo was visited by Fur Shui. 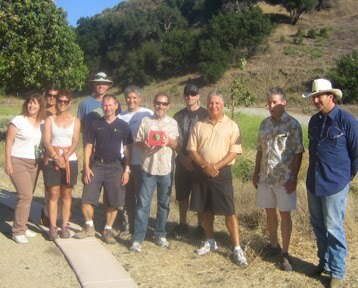 Was a great day from Polar Bear to Flamingo sightings. The Flamingos are such a beauty all adorned in Pink. Spring time is the time for pairing up for these birds of a feather and they are naturally equipped in "pink" to do this! Pink is the color of the love and partnership life space in Feng and Fur Shui. Why not put a little bit of pink on your animal's collar or leash, bed or sleeping area and let it attract love for itself and of course YOU! Think Pink for love! 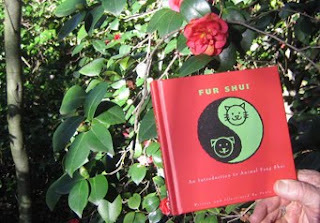 Fur Shui bloomed along with the many beautiful Camellia plants and hedges in March at the Descanso Gardens outside of Los Angeles. What a nice match for the deep red of the flowers and Fur Shui. 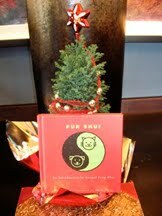 Both red and green signify luck, fame and abundance for many in this new year of the rabbit! 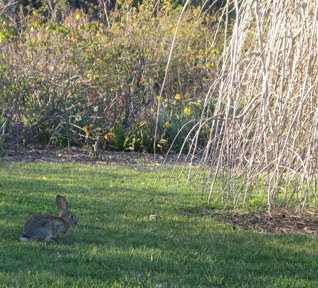 Red is fame, let's all celebrate the famous Descanso Gardens, a wonderful place to stroll, learn and enjoy...and there are many rabbits running about as well in the well kept gardens. Jim and Fur Shui visit the historical site of the Alamo in Texas recently. 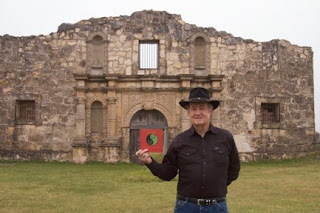 Dressed in black and hat appropriate, Jim also had a acting part in the original film The Alamo alongside John Wayne. Coming back to celebrate his fame with the color red of Fur Shui along with his black outfit (amping up his acting career for sure) which is the color of the career gua, this is a very lucky and auspicious visit for both in quite a famous place! Sunny day in Laguna Beach, CA! Fur Shui visited the Wyland gallery and enjoyed the back porch and sculptures. The Grey Whales are now migrating, so be on the lookout if you are along the SoCal coast. When the whales surface, they look like huge barges floating off shore! Grey is the color of the helpful people / travel gua and these whales that can reach 52 feet in length, live 50-75 years travel 10,000 to 12,000 miles during their migration from the Arctic to Mexico. Travel is their specialty! Cheers and a great 2011 to Marianne and her dog Dexter. 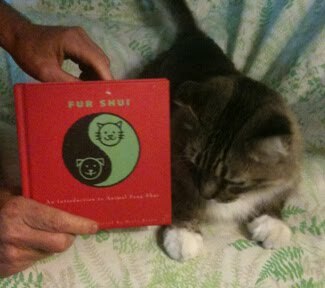 Dexter is "napping" and not in the photo, and Fur Shui decked the halls for both Marianne and Dexter. 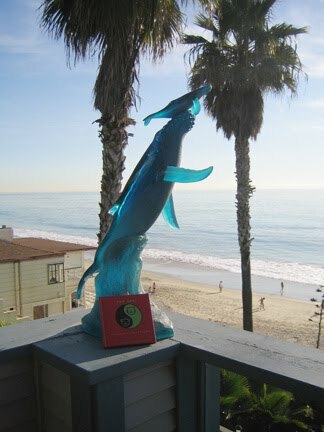 Marianne won a chakra read for her photo send in and Dexter is enjoying the wonderful energy of this new year! 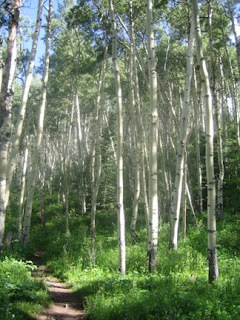 This sweet living tree is sporting a bright big red star. AND, stars do hang out in the fame section of your home and life. Rev up these long darker days with a bit of red for both you and your fur folks and see if you do get energized for the day! Congrats to Dexter! A very Happy New Year to all! This is Caleb who had a love filled Christmas with his person Marilyn. Caleb is a wonderful help / service dog for folks who need a little bit of extra cheer! He enjoyed the angel tree this year...there are 5 angels that pop out to you in this photo. 5 is the number for helpful people / travel gua and this is so true of Caleb's talents! 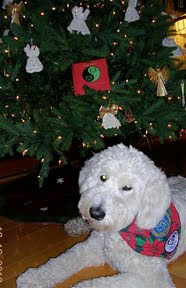 His service kerchief is of the holiday spirit of red and green which recharge him (red/fame) and also strengthen his family love and ties (green/family). 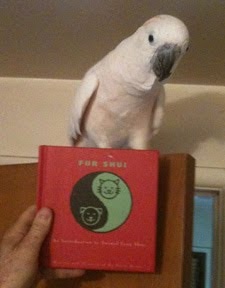 A big Fur Shui salute to Caleb and Marilyn for doing all the good they pass forward!